Uses: sometimes cut as a gemstone and as mineral specimens. 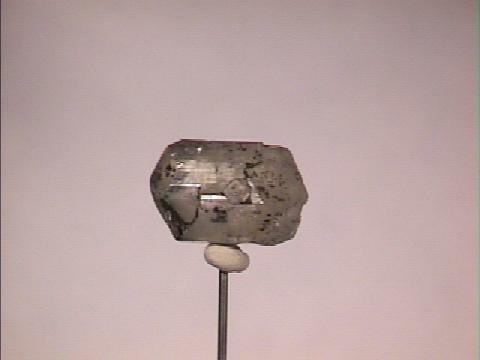 Phenakite is a rare beryllium mineral, but it is found so frequently with precious gemstones that its availablity is not in proportion to its rarity. It is found in pegmatitic pockets and is associated with gemstones such as topaz, beryl especially emerald, chrysoberyl and smoky quartz. The name phenakite, or the alternate spelling, phenacite, is from a Greek word meaning deceiver, an allusion to its deceptively similar look to quartz. Phenakite is one of the few silicate minerals that have a trigonal symmetry. This symmetry is far more common among carbonates than among silicates. Phenakite shares the same symmetry with the emerald green silicate dioptase and the fluorescent and closely related willemite. Fine crystals of phenakite can be perfectly clear and with good hardness, rarity and lack of good cleavage, although somewhat lacking in color and fire, make good choices for gemstones. Color is usually colorless or white but can be tinted yellow, brown and pink. Cleavage in poor in three directions. Specific Gravity is approximately 2.9 - 3.0 (average for non-metallic minerals). Other Characteristics: Prism faces striated lengthwise and index of refraction is approximately 1.66. Associated Minerals are topaz, cassiterite, quartz, calcite, hematite, feldspars, apatite, fluorite, beryl especially emerald, chrysoberyl, bertrandite and some sulfides. Notable Occurrences include sites on the Takowaja River, Ural Mountains, Russia; Minas Gerias, Brazil; Pala, San Diego Co., California; Mt. Antero and Pikes Peak, Colorado, USA and Norway. Best Field Indicators are crystal habit, striations, enviroment and hardness.